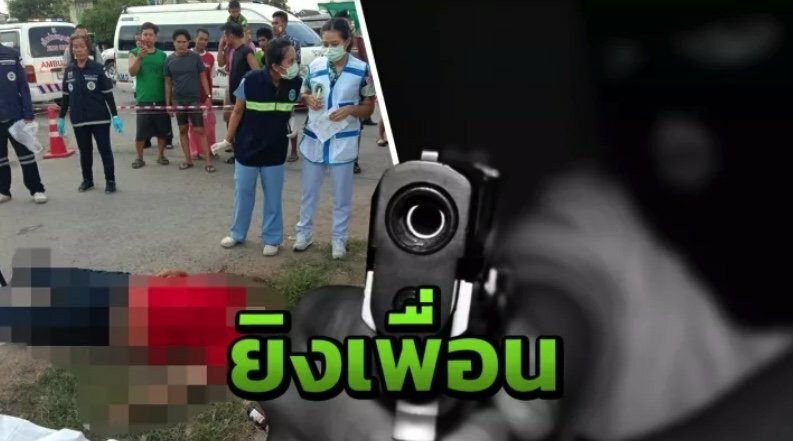 Police are hunting a man who they named as "Kung" after a shooting left 33 year old Surawut dead outside a Lopburi temple. Kung and Surawut had been classmates at school. Surawut was shot in the head after onlookers had seen the pair trying to sort out some problem. Kung then jumped on a bike driven by someone else and fled the scene. Witnesses said the assailant pulled out a gun from his waistband and shot his friend at point blank range in the head. Kung has been in jail many times and is well known to police. Thai Rath reported that the Lopburi governor had ordered police to make a quick arrest. The incident happened in the road outside the temple of Wat Amphawan Wanaram in the Muang Khom police jurisdiction. Are you on the right thread ? This man has been in jail before, was carrying a gun in his waist band, assassinated his long time friend - shooting him point blank in the head. This man is evil and simply needs to be removed from society before he kills another innocent. I suspect some people are beyond rehabilitation. This man is evil and simply needs to be removed from society before he kills another innocent. Any inside info of the victim whether he was "innocent"? It takes two to tango. The standard Thai "level playing field"
Thanks goodness, well done, maybe another shiny badge to go with all the others for your leadership qualities. Not from society, just "removed"